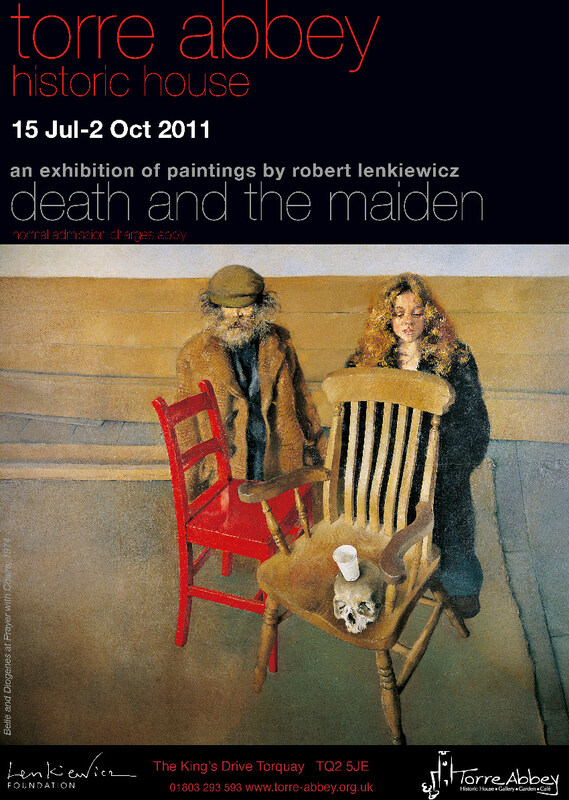 Death and The Maiden was first exhibited in 1974 at Lenkiewicz’s new Clifton Street studio, The Fool. Much of the exhibition comprised framed works on paper which were later bound, together with the painter’s original research notes, into a large folio. The folio contains more than 70 watercolours and drawings and modern facsimile techniques now make it possible to exhibit the contents of the Project notebook much as they would have looked when originally shown. The exhibition also included oil paintings and original works on paper from the Project as well as the major works from the Foundation’s permanent collection. 89 x 119 cm. Oil on canvas. 142 x 117 cm. Oil on canvas. 76 x 99 cm. Oil on canvas. 62 x 46 cm. Oil on canvas. 12.5 x 6 cm. Watercolour. 40 x 58 cm. Watercolour. 33 x 26 cm. Rose thorn, ink and pencil. 41 x 20 cm. Charcoal, pencil and black ink. 38 x 33 cm. Pen, ink and watercolour. 27 x 35 cm. Mixed media. 23 x 34 cm. Watercolour. 9.6 x 15.3 cm. Watercolour. 16.6 x 17.5 cm. Watercolour. and 35 framed facsimiles of its pages. The Father Eats His Son. Study of the Painter’s Dead Mother. Self-Portrait with Eliza. Man Watching Woman Walk Away. Death presenting peace Death Presenting Peace to The Maiden.